Eid-ul-Adha is one of the most important Islamic holiday of the year.Eid-ul-Adha marks the end of Hajj, the sacred pilgrimage to the holy city of Mecca. 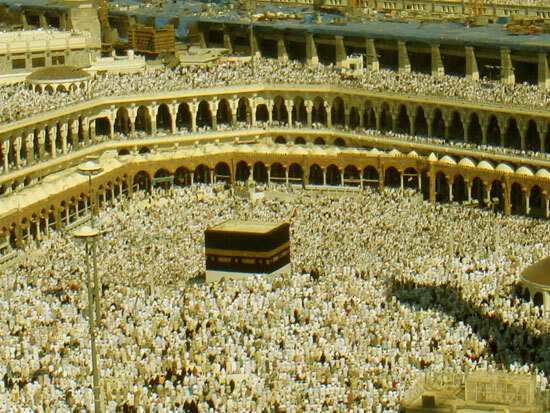 The hajj to Mecca is a once-in-a-lifetime obligation upon male and female adults whose health and means permit it, or, in the words of the Qur'an, upon "those who can make their way there." The history of Eid-ul-Adha can be traced back to the story which states that Abraham was instructed by Allah, in a dream, to raise the foundations of Kaaba,the most sacred shrine in Mecca. Muslims believe that even after undergoing a lot of trials and tribulations on his way to Mecca, God revealed in a dream to Abraham to sacrifice his son Isma’il.Abrahim and Isma’il set off to Mina for the sacrifice. As they went, the devil attempted to lead Abraham astray by disobeying God and not to sacrifice his beloved son. But Abraham remained unfaltered in his decision and true to God, and drove the devil away. As Abraham prepared to kill his son, God stopped him and gave him a sheep to sacrifice instead. Popularly known as the Festival of Sacrifice, this Muslim holiday Eid-ul-Adha commemorates Prophet Abraham’s unselfish act of sacrificing(Qurbani) his own son to the One God, Allah. The festival reminds everyone of the mercy and benefits bestowed upon mankind by Allah. Muslims commemorate this outstanding act of sacrifice by themselves slaughtering an animal such as a sheep, camel, or a goat. When this is done, 1/3 of the meat goes to the needy people, 1/3 is given to neighbors and friends, and 1/3 stays with your family. People who are away from the holy pilgrimage, Hajj, also carry out this traditional sacrifice. This act also reminds the pilgrim to share worldly goods with those who are less fortunate, and serves as an offer of thanksgiving to God. People visit each other's homes and partake in festive meals with special dishes, beverages, and desserts. Children receive gifts and sweets on this happy occasion. Eid ul-Adha occurs on the tenth day of the Islamic month of Dhul Hijja.But the date of Eid-ul-Adha depends on the visibility of the moon each year. It is often referred to as the "Kurban Bayrami" (from Turkish) or "Sacrifice Feast". Eid ul-Adha is also known as Hari Raya Haji in Singapore and Malaysia and Tabaski in West Africa. In south-east Asia Eid-ul-Adha is known by the name Hari Raya Aidiladha.Indians know Eid-ul-Adha as Id al-Adha or Idu’z Zuha. And in Bangladesh, Eid-ul-Adha is known as Eid-ul-Azha or sometimes even Id al-Adha. But whatever the name, the celebratory spirit of Eid-ul-Adha runs high among Muslims all over the world, the geographical variations notwithstanding.